As the internet of things grows to encompass many more “things,” so are the number of wireless ways to connect them. Wi-Fi, ZigBee, Z-Wave, Bluetooth Low Energy and cellular are being embedded in every manner of gadget from thermostats to cars, but industrial IOT specialist Sigfox is suggesting one more type of connection: satellites. 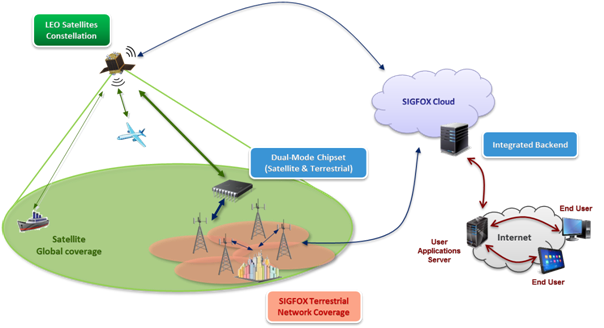 Sigfox is partnering with aerospace company Airbus Defense and Space, French research institute CEA-Leti and engineering firm Sysmeca on project called Mustang that aims to build a hybrid terrestrial/satellite that can be used to connect the internet of things. Sigfox is already developing low-power, low bandwidth wireless networks in several countries designed to connect sensors, industrial appliances and other gadgets to the internet. Its work with Mustang could expand the scope of that network to the entirety of globe. Devices connect to a Sigfox terrestrial transmitter where available, but beam their information up to the heavens when not. These kinds of satellite machine-to-machine (M2M) networks have actually been around for some time, run by big orbital communications provides like [company]Orbcomm[/company], [company]Iridium[/company] and [company]Globalstar[/company]. But Mustang seems to have something more ambitious — or less ambitious, depending how you look at — in mind. Instead of uploading telematics data from military tanks in the desert or collecting data from buoys in the ocean, Sigfox is geared at connecting more everyday objects, from the alarm system in your home to the tracking device on your dog’s collar. These types of networks don’t have much bandwidth: they only need to transmit at few bits per second, they consume very little power and they cost very little to operate. If Sigfox, Airbus and their research partners can optimize a satellite network for those kind of use cases, they would have something quite impressive on their hands. Mustang’s founders said that the project has a three year timeline, in which the plan to develop the modem technology and the communications protocols necessary to make the system work. So while my dogs are connected by Bluetooth and Wi-Fi today, it may take some time before they’re beaming info into space. I love seeing the Internet of Things continue to grow and evolve. However, with these new opportunities, we need to realize there are new risks. Today’s security practices will not protect organizations as the number of access points multiply with seamless connections. It’s time for a true security evolution. Peter Fretty, IDG blogger working on behalf of Cisco. Is Galileo also in the game ? I agree that delays might be a serious problem here. Another question is security. Even now we are dealing with lack of appropriate security of our data, especially when it comes to devices that use WiFi. So huge amount of different data in one place might be very tempting. But how about delays? Although space satellites have huge coverage, they also have very enormous ping. This is one of the cases why we use Ethernet, Wi-Fi and Fiberoptic connection now.